The installation sheds light on the topic of energy poverty by discussing the big differences in technologies used for cooking in the 21st Century and their accessibility. 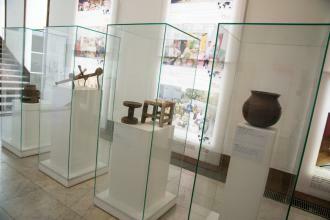 It displays particular artefacts that are widely used for cooking in rural communities around the world. In the Millennium Declaration in 2000, all the countries committed to a global partnership for development and to sharing technologies in order to eradicate global poverty. Despite the enormous technological advances and accomplishments available to some people, part of humanity lives without access to basic development needs, such as energy. Energy is especially important when it comes to cooking, but almost one-third of humankind cooks by directly burning biomass. This causes health problems (mostly to women and children), as well as ecological problems due to deforestation. 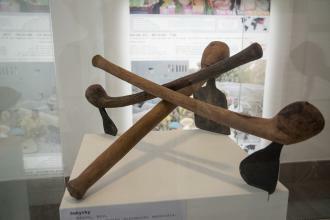 The installation shows traditional cooking tools and dishes still used in many poor areas in so-called developing countries. There is a handmade charcoal stove, as well as an axe and hack used for preparing wood fuel, fire seats, a vaporizer, and the crock-pot that is traditionally used for water-cooling. To many visitors they must seem like archaeological objects from ancient times, but, in reality, they are no more than a few years old. These artefacts are accompanied by information about energy poverty and the dangers associated with using solid fuels in open fires in kitchens. The installation exhibits the items as if they were ancient artefacts, even though they are less than ten years old and they have been used recently. It demonstrates the contrast between the high level of technological development in some regions and the huge technological gap faced by billions of people in other areas. 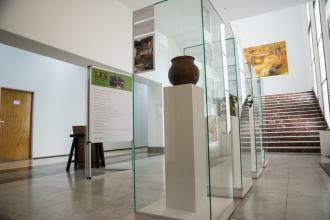 The four showcases containing the artefacts were placed next to the giant posters of another Museo Mundial installation, called “The Hungry Planet”, at the start of the exhibition on the third floor of the museum building. Some posters also show pictures of similar stoves and crock-pots, so that visitors can get an even better idea and imagine how the items are used. The artefacts have been borrowed from a personal collection. The exhibition ends with texts about energy poverty and the big differences between life in rich and so-called developing countries. The installation relates to Millennium Development Goal (MDG) 1 (“Eradicate extreme poverty & hunger”) and MDG 8 (“Global partnership for development”). We found an owner of a few artefacts used in an African village where there is no energy for cooking. It seemed a nice idea to exhibit them in public. The owner was an NGO working in the area of development policy, focused on technology transfer, and was therefore very open to the idea and willing to cooperate. The process took us four weeks. At the start, we had to gather information on the use of traditional technologies. We did some research, contacted people who were there on the ground, and looked for some photos. At the same time, we researched the energy situation in so-called developing countries, especially in areas where there is no electricity or any other infrastructure or modern technologies that might be used for cooking. We have gathered information about the health risks posed by cooking on a coal stove, especially when used without a chimney, as is common in some areas. After the research was completed, we had several discussions with the architect and the experts on how to make the exhibition as impressive as possible. We decided to follow the format of a seemingly traditional exhibition, so that visitors would think at first that they really were looking at ancient objects and would only discover later that these were items currently used by poor families in kitchens around the world. We also decided to add some explanatory texts and agreed to place them on the side of the vitrines. The next step was to look for some vitrines. It was difficult to find suitable vitrines at a reasonable cost. We contacted a few institutions without any luck. Finally, we discovered that we could borrow them at a reasonable price from another museum in Prague. Our architect was very helpful in solving these problems. This step took us about four weeks. The fifth step was to prepare and print the texts and to visualize the exhibition. The preparations and the printing took us two weeks. It did not take too long because Educon has been involved in energy-related topics and energy poverty in so-called developing countries for many years. The implementation in the museum was done by a specialized installation company, which also organized the transfer of the vitrines. We received strong cooperation from the architect in the process of negotiating and preparing the tools, and he also offered the vitrines. In cooperation with the museum, the installation is in an excellent location next to the Hungry Planet exhibition, which covers a similar topic. Therefore, both installations complement each other. The gap between the rich and poor parts of the world and the differences between their standards of living could have been emphasized more. For example, we could have installed modern cooking equipment as well to show more clearly the gap between the sort of technology used by the poorest and the richest communities on the planet.